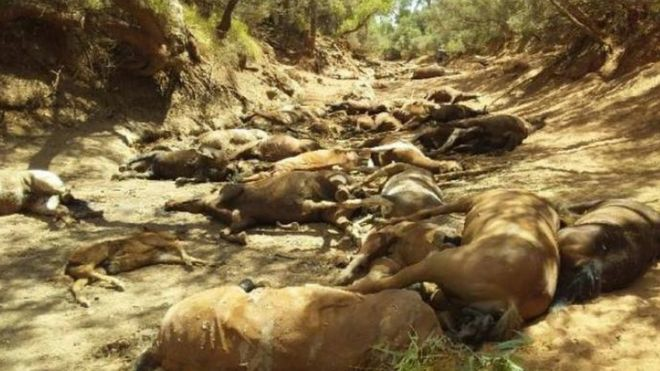 More than 90 wild horses have died in Australia due to extreme heat wave that has broken dozens of records across the nation, BBC reported. According to Australia’s Bureau of Meteorology, temperatures in Alice Springs have exceeded 42°C for almost two weeks. According to BBC, dead and dying animals were found by rangers in a dried-up waterhole near Alice Springs, in the Northern Territory, last week. About 40 of the animals had already died from dehydration and starvation. The authorities, later, culled the surviving horses. According to local authority, Central Land Council, rangers came across the horses after a remote community noted their absence. Photos were also posted by local residents on social media showing horses lying dead along a 100-metre stretch of a swimming hole. One of the residents described the scene as ‘carnage’. According to the BBC, authorities have issued health warnings to people asking them to stay indoors and minimise physical activity. Several other wildlife species have also suffered due to the heatwave. There have been reports of mass deaths of native bats in New South Wales. A million fish have also been found dead along riverbanks.